With new and progressive attitudes towards social problems taking root, the Victorian era saw a boom in the foundation of new charities, voluntary educational associations and mutual benefit societies. At this time, Saturday was traditionally the allocated day for fundraising, hence this society's name. 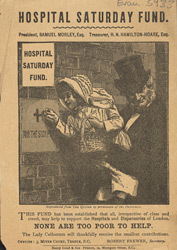 Soon fundraising became more systematic and there were collections every day. In this case, all the money collected was given to the poor to help them pay for medical care.